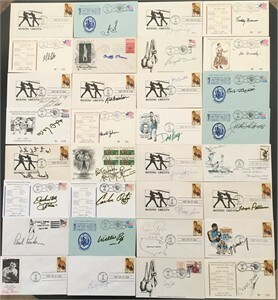 Lot of 32 different First Day Covers or International Boxing Hall of Fame Induction Day postal cachet covers autographed in various pens by boxing Hall of Famers, many deceased: Lou Ambers, Carmen Basilio, Nino Benvenuti, Teddy Brenner, Gil Clancy, Billy Conn, Angelo Dundee, Don Dunphy, Bob Foster (personalized to Brent), Kid Gavilan, Joey Giradello, Emile Griffith, Eder Jofre, Harold Johnson, Don King, Jake LaMotta, Mills Lane (inscribed Let's get it on! 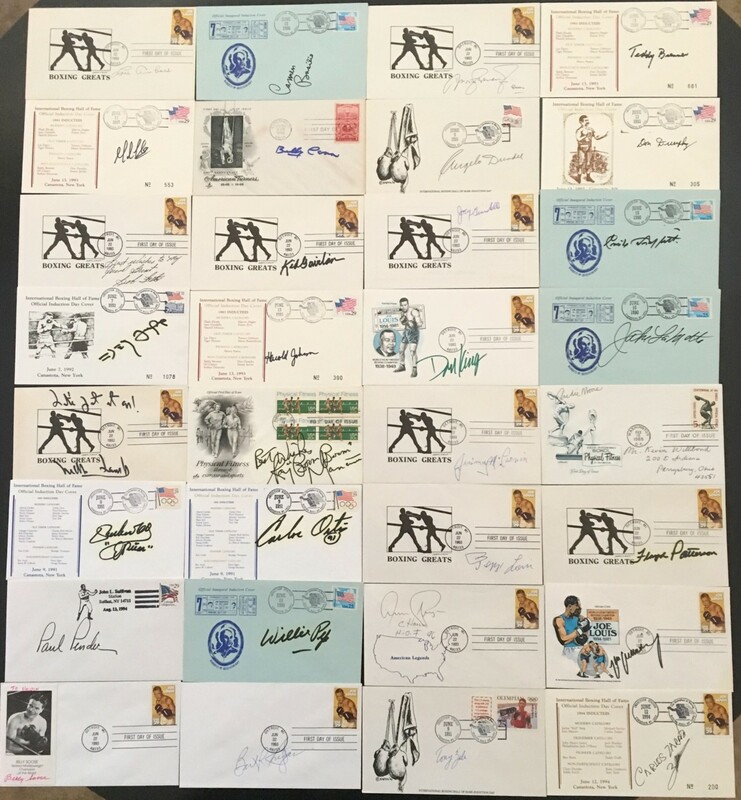 ), Ray (Boom Boom) Mancini, Jimmy McLannin, Archie Moore (has handwritten name and address), Ruben Olivares, Carlos Ortiz, Laszlo Papp, Floyd Patterson, Paul Pender, Willie Pep, Aaron Pryor (inscribed Champ H.O.F. 96), Max Schmeling, Billy Soose (personalized to Kevin), Bert Sugar, Tony Zale and Carlos Zarate. A few of the older covers signed in black Sharpie have typical yellow tinge around the signatures. With certificate of authenticity from AutographsForSale.com. ONLY ONE LOT AVAILABLE FOR SALE.